A wonderful old rose Fantin Latour has pale pink flowers that open with a lovely cupped shape and then develop a more complex reflexed habit. This is a fragrant rose, and is vigorous, although it can be a rose that is slow to establish itself especially in cooler climates. An excellent choice for a position where it can be allowed to grow to form a large bush. It takes well to pruning and with its growth habit you can prune back fairly hard each year. We have grown this rose successfully in a container, it did require some pruning, however the wonderful flowers that appear on the long arching canes make it a real feature when grown this way. Although Fantin Latour is not a repeat flowering rose the flowers do appear over several weeks. Attractive deep green foliage and yes it was named after the French artist of the same name. It is a rose that has been grown for over 100 years, a Centifolia type and does have an attractive perfume. Centifolia roses are often referred to as ‘Cabbage Roses’ and they include a number of older style roses that have been grown for many years. Care of Rose Fantin Latour. Although this is a hardy rose it is a little susceptible to black spot, so best away from humid areas. Mulch to maintain a cool moist root run. 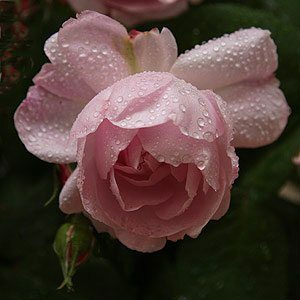 Fertilise in spring with a specialist rose fertiliser. Besides its annual pruning Fantin Latour is a rose that requires little extra care and is fairly drought tolerant.